"Its origin and purpose are still a total mystery." Recreate the look and feel of Stanley Kubrick's masterpiece film! Monolith and moon base accessories in the 1:6 scale of the 2001: A Space Odyssey action figures. Can't-miss collectibles for the truly discerning fan! 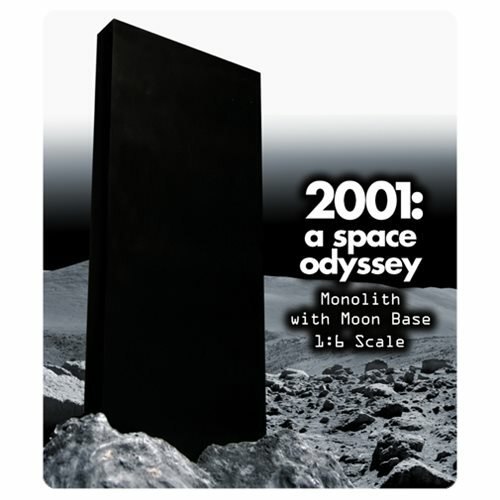 Display your amazing 2001: A Space Odyssey figures (sold separately) with these 2001: A Space Odyssey Monolith and Moon Base 1:6 Scale Action Figure Accessories! They let you really recreate the look and feel of Stanley Kubrick's masterpiece film. Made to fit the 1:6 scale of the 2001: A Space Odyssey action figures, the moon base and monolith are can't-miss collectibles for the truly discerning Stanley Kubrick fan.